It’s been quite a journey – thank you for being with us every step. 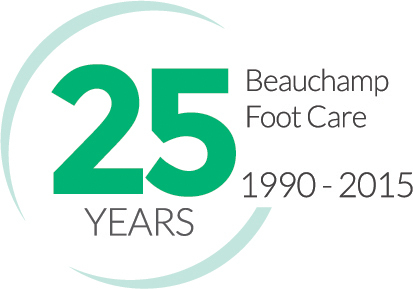 It seems amazing, but it really is true – Beauchamp Foot Care has been in business for a quarter of a century! Naturally, we’re all delighted to have reached that milestone. But we recognise that nothing we have achieved over the years would have been possible without you, our patients. So thank you; we haven’t forgotten those of you who helped our business find its feet back in 1990 – in fact, we still see many of you – and we’re truly grateful to everyone who’s kept us on our toes, so to speak, ever since. Care to know our back-story? While we’ve been wishing each other “happy anniversary” and reflecting on our 25 years together, we’ve realised that there may be a few of you who don’t know how we got started. If you’re one of them and you’d love to find out, read on. If we’ve missed anything, we’ll be happy to tell you in person next time you come and see us. Before we set up Beauchamp Foot Care, Rita, Fiona, Erika and me, Vicky, all knew each other from our days at Scholl in Brompton Road. It’s hard to believe, but in just a few weeks, Erika and I will have been working together for 30 years! Originally, it was the two of us who were enticed away from Scholl. We joined a lady who was opening a new salon, but had only been renting rooms from her for about six months when recession struck and her business collapsed. With nowhere to go but onwards and upwards, we decided to do just that. The first thing we needed was a place to work from. We chose Knightsbridge simply because it was close to Brompton Road where our patients knew us. Once we’d rolled up our sleeves by day to get stuck into the not inconsiderable revamping, and unrolled our sleeping bags at night to get the space ready for our new business, number 48 Beauchamp Place was perfect. And,for the first six years, that’s where we stayed. In 1996, we moved up and into 41 Beauchamp Place which, with its beautifully appointed treatment rooms, has been the home of Beauchamp Foot Care for the last 19 years. If I had the chance to go back 25 years, I can honestly say that there’s nothing I’d change about the way our company has developed. We might be small, but we’re perfectly formed. That means we’re perfectly set up to offer the kind of personal care that brings patients we’ve come to know as friends back to us year after year – only recently I had a new patient who was the son of a couple I treated when I first qualified. Just as importantly, we’re perfectly happy to carry on together as a close and committed team. Looking to the future, we can promise you it will be ‘business as usual’. We’ll be continuing to innovate, as we did when we became one of the first foot clinics in the UK to introduce a new kind of laser technology in 2009. And, as well as making you feel more comfortable, we’ll be doing our best to educate people on the need for regular foot care; to make regular appointments with us the way they do with their dentist and hygienist. In a world where we all want to stay fit and active for longer, our feet are very important. It’s all very well investing in expensive exercise gear and gym membership, but not without proper foot maintenance. After all, a balanced and comfortable foot will protect your knees, hips and back long after the trainers have worn out and the gym has closed down! What else was happening in 1990? The establishment of Beauchamp Foot Care in Knightsbridge wasn’t the only significant and memorable event of 1990. To refresh your memory, if you’re over 25, here in Britain, a heat wave gripped the nation. The mercury in our thermometers rocketed up to a scorching 37.1°C (99°F) in Nailstone, Leicestershire – the highest recorded temperatures in British history. The hot topic in the wider world involved Tim Berners-Lee, who published his formal proposal for the World Wide Web and ultimately allowed me to share this with you on our website!